Wayang golek are wooden doll puppets that are operated from below by rods connected to the hands and a central control rod that runs through the body to the head. The simple construction of the puppets belies their versatility, expressiveness and aptitude for imitating human dance. Today, wayang golek is mainly associated with Sundaneseculture of West Java. However the wooden wayang also known in Central Java as Wayang Menak, originated from Kudus Central Java. Little is known for certain about the history of wayang golek, but scholars have speculated that it most likely originated in China and arrived in Java sometime in the 17th century. Some of the oldest traditions of wayang golek are from the north coast of Java in what is called the pasisir region. This is home to some of the oldest Muslimkingdoms in Java and it is likely the wayang golek grew in popularity through telling the wayang menak stories of Amir Hamza, the uncle ofMuhammad. These stories are still widely performed in Kabumen, Tegal, and Jepara as wayang golek menak, and in Cirebon, wayang golek cepak. Legendary origins of wayang golek attribute their invention to the Muslim saint Wali Sunan Kudus, who used the medium to proselytize Muslim values. 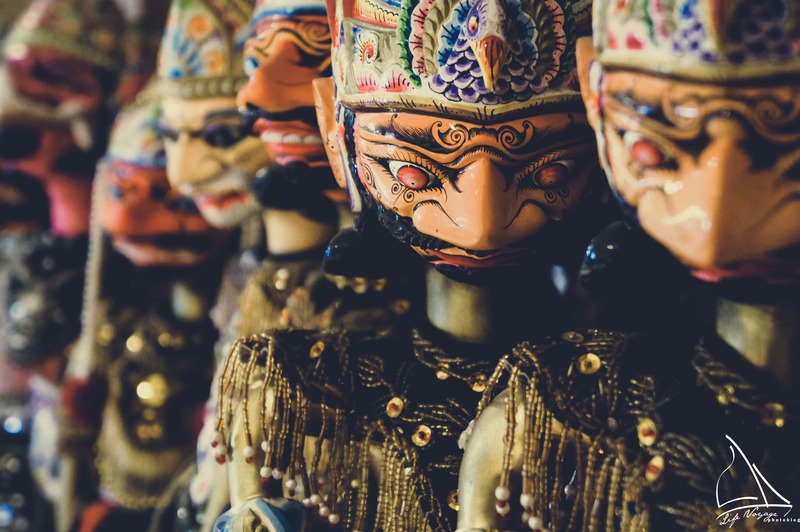 In the 18th century the tradition moved into the mountainous region of Priangan West Java where it eventually was used to tell stories of the Ramayana and the Mahabarata in a tradition now called Wayang Golek Purwa, which can be found in Bandung, Bogor and Jakarta. The adoption of Javanese Mataram kejawen culture by Sundanese aristocrats was probably the remnant of Mataram influence over the Priangan region during the reign of expansive Sultan Agung. While main characters from Ramayana and Mahabharata are similar with wayang kulit purwa version of Central Java, some of punakawan (servant also jester) were rendered in Sundanese names and characteristics, such as Cepot or Astrajingga as Bagong, Dawala or Udel as Petruk. Wayang golek purwa has become the most popular form of wayang golek today and the most famous puppeteer family is the Sunarya family which has produced several generations of stellar performers. Great depth of field in this image, it really pulls you in to focus on the eyes of the puppet. Fascinating history too. Thanks for sharing.